These lovely young ladies making music amongst the trees convey a message of peace and friendship. These lovely young ladies making music amongst the trees convey a message of peace and friendship. 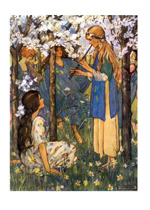 Illustrator Florence Harrison was influenced by the Pre-Raphaelites. Inside Greeting: Wishing you a day full of simple pleasures.